(Nanowerk News) Silicon-based thin-film solar cell with a supplementary organic layer can utilise infrared light as well. The cell consists of many active layers, which taken together are less than one micron thick. The new hybrid solar cell is constructed of two extremely thin layers of amorphous silicon as well as an organic layer. Despite the low volume of materials employed, the hybrid cell attains recording-breaking efficiency of 11.7%. The organic layer is made of fullerenes, also known as 'soccer ball molecules', mixed with semiconducting polymers. It is able to convert infrared light that cannot be utilised by the silicon layers into electrical energy. The complementary compound of organic and inorganic materials in a stacked cell offers a promising option for future solar cells. The cell was jointly developed through the BMBF “Leading-edge Research and Innovation in the New German Länder” programme by teams at the University of Potsdam and HZB who have published their work in the renowned technical journal Advanced Materials ("Hybrid Organic/Inorganic Thin-Film Multijunction Solar Cells Exceeding 11% Power Conversion Efficiency"). The fundamental component of the cell is a very thin layer of amorphous silicon interspersed with hydrogen (hydrogenated amorphous silicon / a-Si:H). These kinds of simple thin-film solar cells do not attain high efficiencies, as they can only use photons in the blue and green regions of the spectrum. 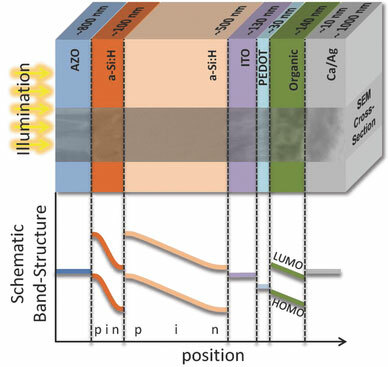 Steffen Roland, a doctoral student in Prof. Dieter Neher’s group at the University of Potsdam, and Sebastian Neubert, a doctoral student under Prof. Rutger Schlatmann in PVcomB at HZB, added first another a-Si:H layer to a tandem cell and then deposited an additional organic layer that enables infrared light as well to be converted into electrical energy. In this manner, they were able to increase the efficiency of the triple-junction cell to over 11%. At the same time, the structure of this solar cell is able to withstand the effects of aging better. This success impressively demonstrates how the close cooperation of doctoral students from different fields of study (organic semiconductors and inorganic semiconductors) leads to new device structures with improved properties.